I resisted watching this for a while. 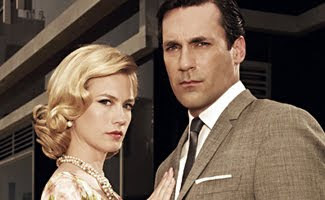 I'd heard a lot of great things about Mad Men but for some reason thought it was an HBO or Showtime series. And since, I tend to have my mother's taste in films and find myself turning off the television in a heartbeat when something offensive comes on (which doesn't take much, like in the first episode of both Rome and The Tudors), I thought this one wouldn't be for me. It has also won several awards, I've come to discover. It's been nominated for multiple Screen Actors Guild Awards. For the third year now, Jon Hamm is a contender for best actor and the show is in the running for best ensemble. (Last year, the series won for the latter.) 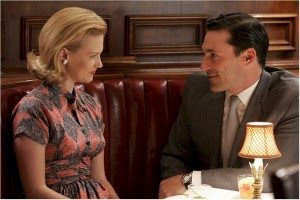 It has received critical acclaim for both its historical authenticity and visual style, has won nine Emmys, three Golden Globes and is the first basic cable series to win the Emmy for Outstanding Drama Series. I am already looking forward to Episode 5, Season 1 tonight!